The Creator definitely had a master plan when He put all the elements needed for growth and success in place. He created two beings—a man and a woman, each made in His image—and told them to become one, and to multiply. He gave them guidelines for happiness, a beautiful place in which to live, and the ability to produce offspring, also in their own image. The miracle of reproduction is still amazing these thousands of years later. The fact that an infant is not only born with its parents’ likenesses, but that its mother can continue to sustain it with life-giving nourishment from her own body is awesome. From its very first cry, she is there to hold her baby close, to suckle it, and establish a bond meant to last a lifetime. The next episode of note involves the birth of a beautiful baby boy during treacherous times. 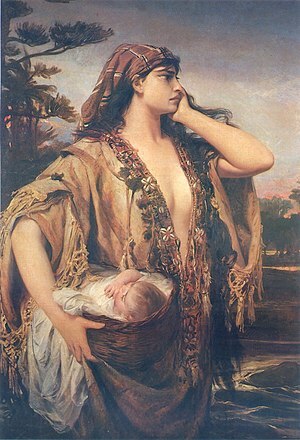 Moses, Jochebed and Amram’s third child, was born under a death sentence. Pharaoh’s maniacal efforts to curb the growing numbers of Israelites resulted in a chilling edict: All newborn baby boys must be thrown in the river and drowned! It is possible Jochebed delivered Moses without the aid of midwives in the interest of secrecy; for three months she succeeded in hiding him. No doubt worried about informers or the risk of discovery by palace troops, she embarked on a courageous plan to save her precious boy. Taking an ark of bulrushes, she waterproofed it with a coating of asphalt and pitch. Then she secreted it among water plants fringing the river’s shore. How heartbreaking it must have been to nurse her tiny son one last time, place him securely in his miniature vessel, and then walk away! Would he stay safe, and warm, and dry? His sister stood a silent sentinel, watching from afar. It could not have been long before Pharaoh’s daughter heard cries of a tiny infant as she neared the water. When she discovered Moses she immediately called for a nurse. 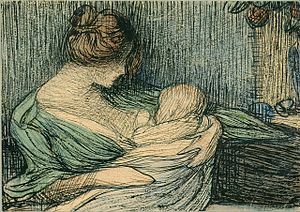 The Hebrew phrase is literally “a woman causing to be breastfed” (‘ishah meyneqet); some translations have “a wet-nurse.” Miriam was there to suggest just such a person—his own mother, Jochebed. Another incident concerns a certain woman named Hannah. Hers is a well-known story. Unable to bear children for years, Hannah begged God to hear her pleas, promising that if He should grant her desire for a son, she would give him back to His service. God heard, and Samuel was born. Scripture says, “…The woman stayed and nursed her son until she had weaned him” (1 Samuel 1:23). Then she took him to the house of Lord along with sacrifices, saying, “For this child I prayed, and the LORD has granted me my petition which I asked of Him. Therefore I also have lent him to the LORD; as long as he lives he shall be lent to the LORD” (vs 27-28). While suckling an infant promotes early bonding, there comes a point when it is no longer possible or practical to do so. The child is weaned, and depends predominantly on other forms of nourishment. There is some discussion about the age when weaning took place. Burton Scott Easton, in his explanation in The International Bible Standard Encyclopedia, remarks that the Hebrew word for “wean,” gamal, “covers the whole period of nursing and care until the weaning is complete (1 Kings 11:20). 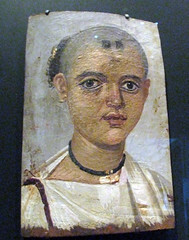 This period in ancient Israel extended to about 3 years, and when it was finished the child was mature enough to be intrusted [sic] to strangers (1 Sam 1:24).” He continues that the “completion of the period marked the end of the most critical stage of the child’s life, [and] it was celebrated with a feast (Gen 21:8), a custom still observed in the Orient” (from International Standard Bible Encyclopaedia, Electronic Database Copyright © 1996, 2003 by Biblesoft, Inc.). On the other hand, Adam Clarke in his commentary on Genesis 21:8 presents different opinions: “The time that children were weaned among the ancients is a disputed point. Jerome says there were two opinions on this subject. Some hold that children were always weaned at five years of age; others, that they were not weaned till they were twelve” (from Adam Clarke’s Commentary, Electronic Database. Copyright © 1996, 2003 by Biblesoft, Inc.). The practicality of either of these ages can easily be disputed. Conventional wisdom seems satisfied that the age for weaning was between two and three years of age, when a child could walk and chew solid food. When Moses was rescued by Pharoah’s daughter, the fact that she called for a nursing woman indicates such services were available should the need arise. Sometimes these women would stay on past the weaning stage, and become a nursemaid or, more modernly, a nanny, to the developing child. 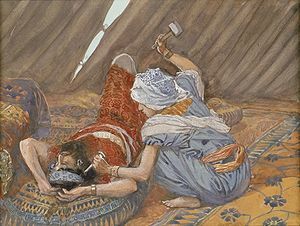 Jochebed may have continued with Moses for some time before bringing him to the Egyptian princess—likely due to a grander plan of a higher power at work. It would not be out of the realm of possibility, in my opinion, that she began teaching him about his heritage as well as simply caring for his physical needs in those formative years. However, the Bible does not directly say. Among the Roman elite, it was not uncommon for a new mother to rely on the services of a lactating slave or a professional wet nurse. However a certain respect and symbolism existed for the mother who suckled her own young. Lynn H. Cohick, in her book Women in the World of the Earliest Christians (2009), writes, “Reflecting commonly held sentiments, Favorinus (ca. AD 85-165) attacks matrons who refuse to nurse their own infants as consumed by concerns for beauty” (p 145). She continues, “Plutarch, writing from the early second century AD, laments the emotional distance between mother and infant resulting from employing a wet nurse” (p 146). Whether or not to nurse one’s baby when it is physically possible continues to be a controversial subject. Although wet nurses are still common in some parts of the developing world, scientific and nutritional advances have provided much of the world with additional means for proper nourishment for infants. There is however a rigorous movement advocating breastfeeding. The only thing missing, at least in this country, is the grand celebration when a child is finally weaned. Posted in Bible women, Breastfeeding, Courage, Hannah, jochebed, Mothers, Nursing, Sarah, Uncategorized, Wet nurse. Bookmark the permalink.